This week, the American Federation of Teachers decided – after years of opposing high-stakes testing – to embrace it. That’s right. The second largest teachers union in the country took everything their constituent educators hate and gave it a big old sloppy wet kiss. Why not get rid of all high stakes tests? Why not at least get rid of the “informational” ones and reduce the total to three? The idea goes something like this. We have to ensure our schools are serving the needs of all our students. And the ONLY way to do that is through standardized tests! That’s what they’re saying. Anything else – unless it is coupled with test scores – is unreliable. Portfolios of student work? Insufficient! A sworn affidavit by classroom teachers on the lives of their firstborn children!? Probably insufficient, too! To be fair, one could argue at least the AFT is trying to reduce the number of high-stakes tests. But the total number of tests will remain the same as it is now – ridiculously high! Kids will still test just about every year – much more than any other comparable country. Test prep will remain the de facto curriculum at most schools. Moreover, the very idea that all the other non-high stakes tests could somehow remain purely informational is naive at best! Even if the terrorists only put the gun to your head occasionally, that still perverts the whole process. Why would the AFT change its long-held position now? It’s no accident. The law that governs our entire K-12 school system is about to be rewritten. Congress is trying to reauthorize the Elementary and Secondary Education Act (ESEA). When the law went through its last rewrite, it was called No Child Left Behind – a classic Bush era euphemism to hide that the legislation did exactly the opposite of its name. Simply put: it was a disaster. It made annual standardized testing the centerpiece of our whole school system. We couldn’t do anything without it. Bubble tests became the only measure of success. Forget that all the evidence shows standardized tests don’t actually measure student learning. They show parental income. Rich kids generally score high and poor kids score low. Forget that they’re based on highly subjective cut scores that fluctuate each year and are determined by temporary workers most of whom have no education degree and have an incentive to fail the most students they can. Forget that they steal time from actual learning, create an environment of fear and are the prime excuse to punish and close schools serving minorities and the poor. Standardized tests return a score, yes. And if you ignore how that score is subjective and educationally inaccurate, you can pretend it’s a universal measure of learning. Then you can use it to justify almost anything as being educationally necessary. Skimp on education funding? They deserved it because Accountability. Privatize a school? They deserved it because Accountability. Bust a union? They deserved it because Accountability. We used to know better. 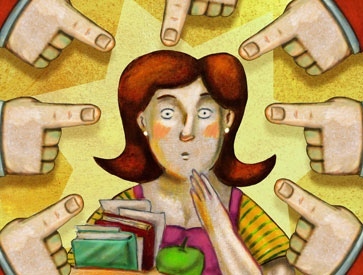 Students used to be accountable to teachers and parents. If you didn’t do your homework or try your best in school, you’d earn a failing grade. Teachers used to be accountable to their principals. Administrators would observe their teachers throughout the year and determine if they were doing a good job. Principals were then accountable to superintendents who were, in turn, accountable to the school board and finally the community of voters. The buck stopped at the voting booth. But not anymore! Now the student, teacher, principal, superintendent, etc. are all at each others throats being held accountable to the standardized tests. Who’s accountable for the tests? The for-profit corporation that developed them. And who is the corporation accountable to? It’s shareholders. So we’ve gone from a system where the buck stopped at the community to one where it stops at investors. Does no one else see a problem with this? Communities are made up of people many of whom have a vested interest in the children who live and go to school there. We’re talking about parents, teachers and taxpayers who want to live among other educated people. But shareholders only care about getting a return on their investment. They don’t care about the quality of the service they’re providing – only that they can make money providing it. And if lowering the quality will raise the payout, so be it! So when people justify standardized testing based on accountability, they’re really deifying the bottom line – profits. But, of course, you can’t say that aloud. The move is being cloaked in the costume of Civil Rights and progressive politics. The AFT partnered with the Center for American Progress – a privatization cheerleader that poses as a bastion of liberalism. Likewise, 19 Civil Rights organizations including the ACLU and NAACP were convinced to sign on. Silly me. I thought Dr. King had a dream that everyone would be judged by the content of their character – not the results of their bubble tests! But – say-it-with-me – Accountability. There can be no alternative but standardized tests. We can’t trust classroom grades. We can only trust cut scores. We can’t trust teachers. We can only trust corporations. We can’t trust the school board. We can only trust the shareholders. And thank goodness! Otherwise, Congress might listen to what ordinary folks have to say! Heck! Congress is starting hearings on it next week! They could vote to stop mandating annual standardized testing! Can you imagine how that would hurt the testing industry!? Billions of dollars might be lost! Imagine the kickbacks and political favors at risk! Like, for example, emailing testimony against testing to the US Senate at FixingNCLB@help.senate.gov by Monday, Feb. 2. -Special thanks to Aixa Rodriquez and Owen Jackman for being extra sets of eyes when my own couldn’t stay open anymore. If there are remaining errors, they are mine alone. -This article also appeared in the LA Progressive, Public School Shakedown and the Badass Teachers Association Blog. My dream for my children is to see common core demolished ! They are individuals who deserve a solid education not this back door money making mess for a few. Arne Duncan,us parents care ! Wake up Ohio and don’t let big business and government push us around. The carrot was nothing but a trick. What is happening Feb 2nd? I checked to see if the HELP Senate Committee is meeting and I can’t find future hearing dates, only past hearings. This sounds like an opportunity to give feedback that we should publicize and push in our groups but I need to find a reference to the hearing first. Thanks in advance. North Dakota legislature is having a hearing on stoping Common Core in ND on Feb 2nd. I will be there to support this bill. Here is what my teaching is reduced to; short presentations of topics I know will be on the test and little depth to any of them. Consequently, my students are getting only enough knowledge to answer test questions and insufficient time to actually learn material well enough to call on it in their futures. More time is spent reviewing than teaching. And when I do get to teach, it is to-the-test. I must, if that is what I am being judged on. I entered this profession to teach, not tutor. My accountability should be tied to the success of my students once they enter the real world, not on how they performed on a set of questions one afternoon. Get rid of the tests! Excellent post! I hope you don’t mind if I pass it around. Don’t know if you follow Ravitch’s blog or not, if you do then you will have seen this post. I believe it needs to be spread far and wide. Why all educational standards and standardized testing are COMPLETELY INVALID. Please feel free to use any of it and pass it around. If you have further questions you can contact me at: dswacker@centurytel.net Just reference Wilson or standards, etc. . . in the subject line so I don’t automatically delete it.